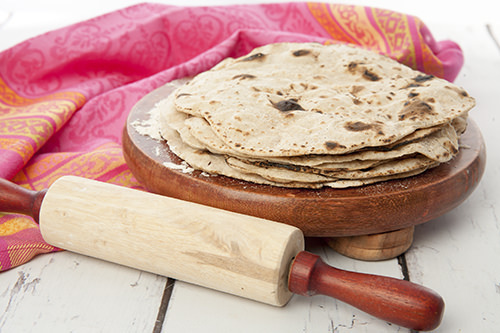 This chapati bread recipe is a traditional Indian flatbread, also called a Roti, that is commonly eaten in Indian households. Generally, the bread is made freshly each day to serve with meals. The Chapati bread is used to soak up the sauce make the dish more filling. It’s cheaper to make more Chapati then to add more meat to the meal, also making it a budget-friendly addition to each meal. Chapati bread is often made with wholemeal flour, and today we’re using a less processed flour – atta flour. Atta flour can be found at some supermarkets and Indian Grocery stores. Mix well and knead for 10 minutes. Cover with a clean tea towel that is damp and leave to rest for 5 minutes. Knead for another 2 minutes, until the dough is smooth. Divide the dough into 3 parts, and divide each part into 5 evenly sized balls. Dust your work surface with atta flour and roll each ball into a thin circle that is 8-10cm in diameter. Place a skillet or tawa over high heat and cook each dough circle for 15-20 seconds, until it starts to bubble. Pick up the chapati with metal tongs and hold the bread over an open gas flame. Turn the bread over when it begins to puff, ensuring it doesn’t burn. The bread can be served immediately or cooled then stored in an airtight container for up to 1 week. Indian Chapati Bread is a flatbread which is commonly eaten with most meals in an Indian household. Here is a super easy and fast recipe for you to enjoy. In a mixing bowl, place the atta flour, salt, and water. Place a skillet or tawa over high heat and cook each dough circle for 15-20 seconds, until it starts to bubble. Flip the dough over and cook for another 10-15 seconds. Pick up the chapati with metal tongs and hold the bread over an open gas flame. Turn the bread over when it begins to puff, ensuring it doesn't burn. Optional: Brush the chapati bread with ghee after removing from the heat and serve warm. To make a larger batch of this Indian Chapati Bread recipe just increase the servings in the serving amounts above. Mac and Cheese Recipe – Macaroni with 4 Cheeses DELICIOUS!